Canada's annual exports increased 5.4% to $549.6 billion in 2017, mainly on higher exports of energy products. Imports increased 4.8% to $573.6 billion, with widespread gains throughout the product sections. Consequently, Canada's annual merchandise trade deficit with the world narrowed from $25.9 billion in 2016 to $24.0 billion in 2017. Following a 0.5% decline in 2016, Canada's total merchandise trade—exports plus imports—rose 5.1% in 2017. This was the largest increase since 2014, when trade activity increased 9.0%. As a measure of openness to merchandise trade, the ratio of merchandise trade to nominal gross domestic product (up 5.4% to $2,145 billion) narrowed slightly from 52.5% in 2016, to 52.4% in 2017. The increase in trade activity in 2017 was the result of gains in both US and non-US trade, as Canada's total trade with the United States increased 3.9% and trade with non-US countries was up 8.0%. As measured by the Herfindahl-Hirschman index (HHI), the degree of diversification of Canada's exports by market of destination remained unchanged at 0.56 in 2017, which represents high concentration. Both exports and imports were up in every quarter in 2017 except the third quarter. Canada's quarterly merchandise trade balance remained in deficit throughout 2017. The trade deficit expanded in each of the first three quarters of the year, reaching $8.7 billion in the third quarter. In the fourth quarter, a rebound in exports resulted in a narrowing of the deficit to $7.5 billion. Annual export prices rose 4.1% while volumes increased 1.3%. Meanwhile, import volumes were up 4.1% and prices edged up 0.7%. Comparing the average exchange rates of 2016 and 2017, the Canadian dollar gained 1.5 US cents relative to the American dollar, the first annual appreciation since 2011. Canada's terms of trade with the world increased 1.9% in 2017 to 0.91 (reference year 2007), the first annual gain since 2013. Total exports were up 5.4% to a record $549.6 billion in 2017, the first annual increase since 2014. The gain in 2017 was due to higher exports of energy products and metal and non-metallic mineral products. Partially offsetting these increases were lower exports of motor vehicles and parts and consumer goods. Exports excluding energy products were up 1.1%. Non-energy exports increased significantly in 2014 and 2015, but have grown more modestly in the last two years. Canadian goods sold abroad in 2017 (HHI=0.09) were diversified in nature but showed increased concentration compared with 2016 (HHI=0.08). Exports of energy products rose 32.4%, on the strength of higher shipments of crude oil and crude bitumen. The growth was mostly due to higher crude oil prices (+24.6%). Export volumes of crude oil increased 5.7%, despite declines in the third (-2.2 %) and fourth (-5.6%) quarters related to severe weather and pipeline disruptions in the United States. On a customs basis, the share of Canadian heavy oil exports increased from 64.7% of total crude oil exports in 2016 to 70.5% in 2017. The share of heavy oil in crude oil exports has increased in each of the last three years. More than half of all crude oil was exported to three US states that have heavy oil refining capacity: Illinois (39.5%), Texas (11.3%) and Minnesota (9.5%). Exports of metal and non-metallic mineral products were up 10.9% to a record $63.7 billion in 2017. Higher exports of aluminum (+20.3%) and iron and steel products (+20.0%) contributed the most to the increase, both rising on higher prices and volumes. For each of these two products, the share of exports destined for the United States was roughly 88% in 2017. Partially offsetting these increases were lower exports of motor vehicles and parts, which fell 5.3% to $92.8 billion. Exports of passenger cars and light trucks were down 6.9% to $65.2 billion, following record exports of $70.1 billion in 2016. Several factors contributed to the decrease in 2017, including the production reallocation of some models to Mexico, atypical temporary plant closures for retooling, labor disruptions, and declining market share in the United States for some Canadian-built models. The 2006 Softwood Lumber Agreement between Canada and the United States expired on October 12, 2015. In 2017, the U.S. Department of Commerce applied preliminary countervailing and anti-dumping duties on a temporary basis, and finalized these duty rates in late December. Canadian export values of softwood lumber fluctuated substantially throughout the year as duty rates and coverage varied. On a quarterly basis, the value of exports of lumber and other sawmill and millwork products declined in the first (-2.2%) and third (-6.4 %) quarters of 2017. The modest increase in second quarter exports (+0.3%) resulted from growth in prices and lower volumes, while higher prices combined with temporary tariff reprieves contributed to a sharp 13.7% fourth quarter nominal increase. In spite of those fluctuations, for the year, exports of lumber and other sawmill and millwork products increased 4.0% to $16.3 billion. The increase can be attributed to higher prices, which rose 10.3%, and coincided with strong US demand. New residential construction in the United States has been growing steadily since 2011, with new construction starts in 2017 exceeding the previous year's level. After falling slightly in 2016, imports increased 4.8% to $573.6 billion in 2017. While gains were observed in 9 of 11 commodity sections, imports of motor vehicles and parts, energy products and consumer goods accounted for more than half of the growth. Imports of motor vehicles and parts increased for an eighth-consecutive year, rising 4.7% to $111.7 billion. Passenger cars and light trucks led the increase, up 8.1% to $51.7 billion, which coincided with record sales volumes for light vehicles in Canada. Imports of motor vehicle engines and parts, however, were down 2.9%, as weakness in Canadian exports of passenger cars and light trucks meant lower demand for components. In 2017, Canada's trade deficit in motor vehicles and parts reached $18.8 billion, the largest deficit on record. Canada's last trade surplus in motor vehicles and parts was in 2006. Imports of energy products rose 16.6% to $31.9 billion in 2017. As observed with exports, the growth reflects higher prices, which rose sharply in 2017 after two consecutive years of declines. Crude oil and crude bitumen led the increase, with higher imports from the Unites States. The share of crude oil imports from the United States has risen in recent years, growing from 7.5% in 2012 to 51.5% in 2017, mostly on higher imports coming from Texas and North Dakota. Exports to the United States represented 74.7% of Canada's total exports in 2017, down from 75.2% in 2016. Meanwhile, the share of Canada's imports from the United States decreased from 65.8% in 2016 to 64.6% in 2017. Historically, the United States' share of Canada's imports peaked at 77.0% in 1998, while the export share peaked at 83.9% in 2002. Following two consecutive annual decreases, Canada's exports to the United States were up 4.7% in 2017 to a record $410.8 billion. Higher exports of crude oil and crude bitumen were partially offset by lower exports of passenger cars and light trucks. These two commodity groupings, along with motor vehicle engines and motor vehicle parts, were the top exported products to the United States in 2017. Imports from the United States were up 3.0% to $370.7 billion, mostly on higher imports of energy products; basic and industrial chemical, plastic and rubber products; industrial machinery equipment and parts; and motor vehicles and parts. The top imported commodities from the United States in 2017 were passenger cars and light trucks and motor vehicle engines and motor vehicle parts. Canada's merchandise trade surplus with the United States widened from $32.3 billion in 2016 to $40.1 billion in 2017. Imports from countries other than the United States increased 8.3% to $202.9 billion. About one third of this increase was attributable to higher shipments from China (+13.4%), as imports of communications and audio and video equipment increased. Imports from Mexico (passenger cars and light trucks) and Japan (gold) also contributed to the growth in 2017. The top imported product from non-US countries was passenger cars and light trucks. Exports to countries other than the United States rose 7.5% to $138.8 billion. Higher exports to China (+11.6%) led the gain, mostly on increased exports of canola and wood pulp. Shipments to Japan (+10.7%) also contributed to the growth, mainly on higher exports of coal. Canada's merchandise trade deficit with countries other than the United States widened from $58.2 billion in 2016 to $64.1 billion in 2017. 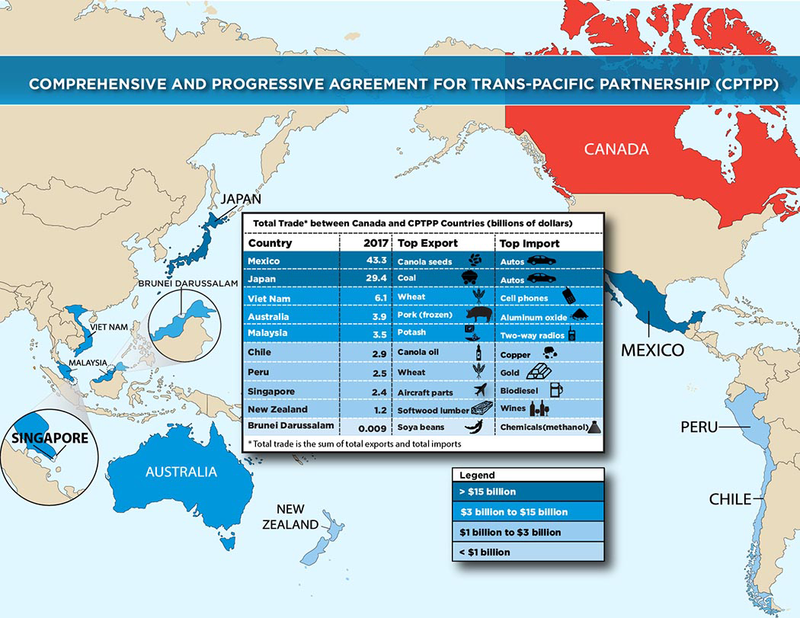 In March 2018, Canada signed the Comprehensive and Progressive Agreement for Trans-Pacific Partnership (CPTPP). The multilateral trade agreement includes 10 other partner countries: Australia, Brunei Darussalam, Chile, Japan, Malaysia, Mexico, New Zealand, Peru, Singapore and Viet Nam. Once ratified by the governments of each country, the agreement will reduce non-tariff and tariff barriers between members. In 2017, Canada's total trade activity on a customs basis with the CPTPP members totalled $95.2 billion. In the past two years, Canada's total trade with these 10 countries has increased at more than twice the rate of its overall trade activity. In comparison, Canada's total trade activity with the North American Free Trade Agreement (NAFTA) countries totalled $746 billion in 2017, while total trade with the European member countries of the Comprehensive Economic Trade Agreement (CETA) totalled $108 billion. Trade with CETA members, which came into effect in 2017, rose 7.0% compared with 2016. In 2017, imports from CPTPP countries were $68.3 billion (12.2% of Canada's total imports with the world) and exports were $26.9 billion (4.9% of Canada's total exports with the world). Combined trade with Mexico and Japan accounted for roughly three quarters of both the import and export values. Compared with 2016, imports from the CPTPP countries increased 6.2% and exports rose 8.3% in 2017. Since 2010, Canada's imports from the CPTPP countries have risen 43.1%. The top imported products from this group of countries in 2017 were motor vehicles and parts, electronic and electrical equipment and parts, and consumer goods. Imports from Mexico accounted for the largest share (52.0%) of Canada's imports from the CPTPP countries, with motor vehicles and parts representing almost half of all imports from this country. These imports were roughly evenly split between passenger cars and light trucks, and motor vehicle engines and motor vehicle parts. Imports from Japan accounted for 25.6% of Canada's total imports from the CPTPP countries in 2017. Canada's imports from Japan were led by motor vehicles and parts, and industrial machinery, equipment and parts. Since 2010, Canada's exports to the CPTPP countries have increased 39.9%. The top exported commodities in 2017 were canola, meat products, coal and wheat. Exports to Japan accounted for the largest share (44.0%) of Canada's exports to the CPTPP countries, followed by Mexico (29.2%). Canada's exports to Japan were widespread among products, led by coal, meat products and canola. Exports to Mexico were also diversified, with motor vehicle engines and motor vehicle parts, and canola being the top exported products to that country. Export diversification refers to the extent to which Canada's export base is broad, in terms of trading partner countries, products, or provinces of production. A concentration index, the Herfindahl-Hirschman index (HHI), has been used as an inverse measure of export diversification. For more information on export diversification, see Measuring Canadian export diversification. Heavy oil as per the definition in the Canadian export classification, code 2709.00.10, petroleum oils and oils obtained from bituminous minerals, crude, having a relative density of 0.9042 or more (less than 25 degrees American Petroleum Institute (A.P.I.)). Aluminum products and iron and steel products as defined in the North American Product Classification System: unwrought, basic and semi-finished aluminum and aluminum alloy products; unwrought iron and steel and ferro alloys; and basic and semi-finished ferrous metal products. International trade data by commodity are available on both a balance of payments (BOP) and a customs basis. International trade data by country are available on a customs basis for all countries and on a BOP basis for Canada's 27 principal trading partners (PTPs). The list of PTPs is based on their annual share of total merchandise trade (imports plus exports) with Canada in 2012. BOP data are derived from customs data by making adjustments for factors such as valuation, coverage, timing and residency. These adjustments are made to conform to the concepts and definitions of the Canadian System of National Accounts. Customs based data were used in the analysis of Canada's trade in commodities with its trading partners. The data for the remainder of the analysis are on a BOP basis, seasonally adjusted and in current dollars, unless otherwise indicated. Constant dollars are calculated using the Laspeyres volume formula (2007=100). Prices are calculated using the Paasche price index (2007=100). However, the terms of trade index, the price of exports relative to that of imports, is calculated using the Laspeyres price index. Data in this release are available in Tables 12-10-0001-01, 12-10-0006-01, 12-10-0007-01, 12-10-0011-01 and 12-10-0099-01, and the Canadian International Merchandise Trade Database. Monthly data on Canadian international merchandise trade for May will be released on July 6.